On the first day of the 2018 Honsha EDM, individuals from all over the world began their journey to the origin of TPS and Lean, eager to learn the thinking and practices. The participants come from a diverse background in the organizations they represent, the industries in which they work, and parts of the world they call home. Team members journeyed back to the humble beginnings of Toyota as they toured the Toyota Museum in Nagoya. The group observed firsthand the loom operations and technology that inspired kaizen and served as the springboard to Toyota Motor Manufacturing’s current success. Another section of the museum displayed Toyota’s automotive operations. 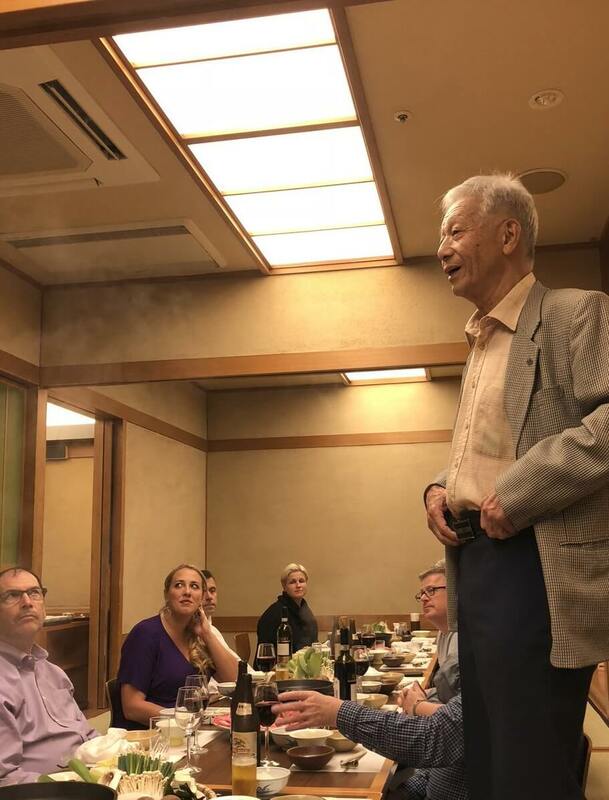 Back at the hotel, team members and EDM leaders discussed the plans for the week and how to preserve the harmony or the ‘Wa”– not an easy task for such a large group of non-Japanese roaming around Japan. On this day team members engaged in an interactive lesson on TPS at a Dojo led by former Toyota Senseis. By guiding the team through a simulated assembly process, the leaders encouraged participants to challenge themselves and their organizations back at home to look for simple, cost-effective kaizen solutions to problems they identify. EDM participants learned about waste and value-added work. Wrapping up the day, team members discussed the possible applications this knowledge could have in their respective organizations. It was a great reminder to remain attentive and thankful. The evening was spent over dinner with a former Toyota Plant Manager who was a student of Taichi Ohno. It seems we never tire of hearing about the early days of TPS. A highlight of the EDM tour was a visit to Toyota, where participants had the chance to observe world-class manufacturing in action. Team members identified fundamental lean practices at work in each department, from Body Weld to Assembly. Throughout the tour, participants were amazed at the seamlessness with which the manufacturing process unfolded. During the tour, guides emphasized the need for PDCA and identifying the root problem in ensuring worker safety, efficiency, and quality. In the afternoon we visited a tier 1 supplier. Is it possible that suppliers must be even more flexible and more aligned with TPS than Toyota plants? This example showed us this may be the case. At this location, participants noted a clear emphasis on adhering to TPS principles and observed well-executed examples of visual preventative maintenance systems. We saw great kaizen in the shipping area where fork trucks were eliminated from the process, saving significant time and resulting in a shorter lead time to the customer. Most striking in the visit was the total embrace of what we might see as “Lean Culture”. A presentation by a Quality Circle leader was an amazing example of people development and team problem solving. She said that the team will work together for 3 years and will look at a progression of problems over that time frame with different themes. Each year, each team member also identifies themes for their own leadership development. Here, we observed a great example of patient, long-term development– a hallmark of true lean culture. While day 2 was a look at world-class TPS benchmark organizations day 2 was a chance to see how “normal” companies live. On this day, the team made its way to a small, family-owned supplier who is early in their TPS journey. Participants observed systems the supplier used to eliminate waste and pointed out examples of simple, effective kaizen throughout the process. The CEO greeted us with a warning that they are not a very good example of TPS but they are trying to improve each day. Rarely do we consider the higher-level aspects of Lean. At a societal level proper recycling is the ultimate in waste reduction. Japanese law requires large appliances to be recycled, so manufacturers partner to build recycling centers. Today we visited a center run by Sony that recycles not only Sony goods but those from other manufacturers, as well. It was inspiring to see how a society can come together for the greater good. Noteworthy in the presentation was how the company focused on education by hosting many school children throughout the year and teaching through scaled versions of their recycling processes. No doubt many aspiring engineers have been influenced by these demonstrations. Also of note was how the company demonstrates high-level PDCA. 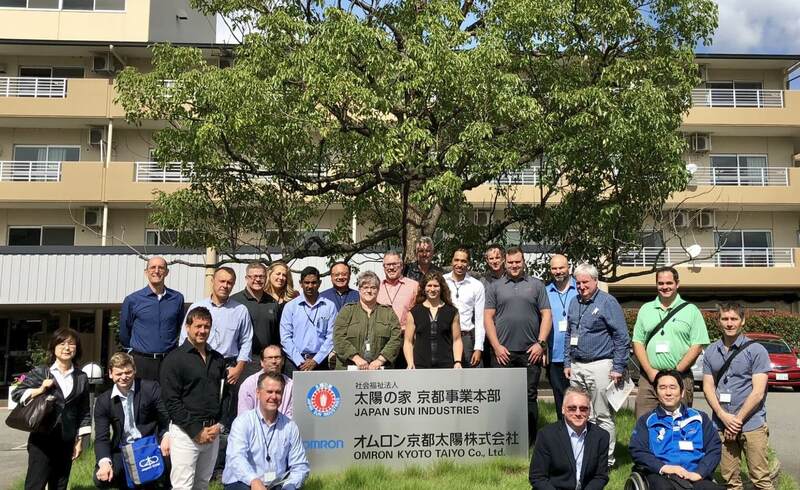 Several times per year, appliance manufacturer representatives visit the company, gaining insights on how to better design appliances for disassembly, closing the 10-year PDCA loop. EDM participants enjoyed their time visiting an OEM manufacturer of musical instruments, amazed not only by the craftmanship of the completed instruments but also the processes they observed in manufacturing. Participants were stunned by the emphasis the manufacturing process put on team members’ sensory skills and the total cycle time it took to complete the finished product—up to 1.5 years (material prep to completed product). On this afternoon, the EDM team visited a company that is both a Tier 1 and a Tier 2 supplier to automotive and non-automotive companies. 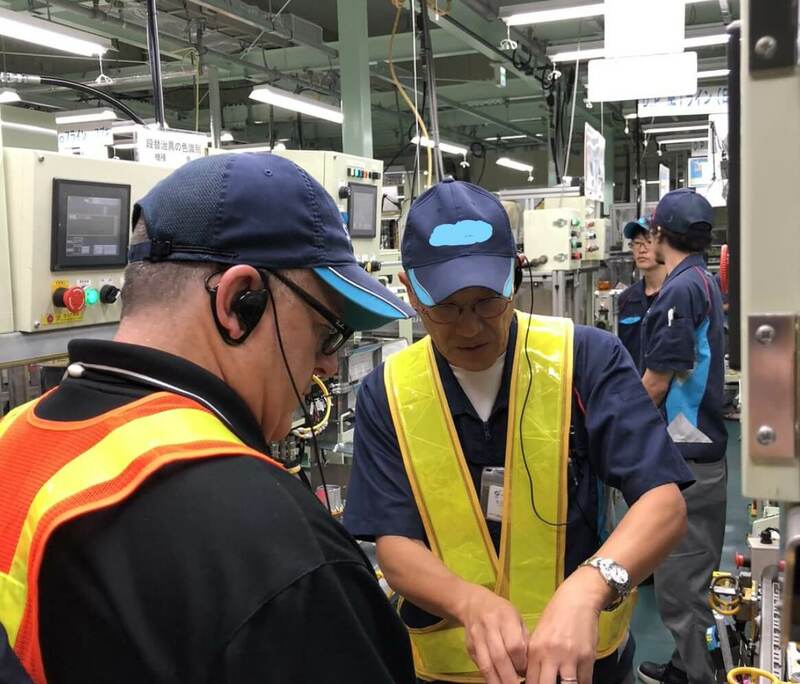 The CEO once said, “I am not sure we are a very good example of TPS but I do have a picture of Tiachi Ohno working in one of our plants.” As a 102-year supplier for Toyota (and Toyoda Loom Works in the beginning), this company exemplifies the Courage and Humility it takes to continuously improve over an extended period of time. Here, participants learned from the plant manager the internal/external Kanban system used at the facility, which has set a target of 10 kaizens per employee per year. These kaizens could be as small as reducing 0.1 seconds, but team members and leaders were proud of the contribution their kaizen made to the facility. The Plant Manager said, “Innovation is what you discover when you do lots of kaizen”. At this point the EDM transferred to Osaka via the shinkansen bullet train. This technological and cultural wonder was a first for many of the participants. What is your companies’ purpose? This is the company motto of Omron Kyoto Taiyo, a joint venture of Omron and Japan Sun Industries. “We endeavor to build an environment where disabled people can find motivation in working independently.” Said the founder. Thus, Omron focuses Kaizen on finding ways to make processes workable for people with varying degrees of physical, mental, and emotional abilities. From line set-up to building design, Omron is a model of a company that truly thinks about its purpose and how they can align their activities with that purpose. One Omron team member commented on the first time they received a paycheck and were able to pay taxes. They said they finally felt like they were contributing to society. This seemed to resonate with Honsha EDM participants and provided a bit of perspective, if not a paradigm shift. True to the motto of not being a charity, this company is serious about being competitive as a manufacturer. While touring the plant, EDM participants observed effective examples of 5-S, as well as a high degree of standardization. Everything was visually controlled! Participants left with the challenge to go back to their companies and consider their purpose and what they are contributing to the greater good. In the afternoon, we particularly enjoyed an experience within a traditional restaurant location in Kyoto. We were treated to a presentation from a restaurant industry executive (and university researcher) who loves sharing insight on the subtleties and challenges of the Japanese restaurant environment. He explained how the company faces many challenges and what they are doing to overcome the challenges. From a societal standpoint, the population is shrinking and getting older. From an industry standpoint, service organizations and the restaurant business specifically, suffer from low productivity when compared to other types of businesses. It was fascinating to hear how they utilize long term and short term PDCA to overcome the challenges. Their focus on people development was made evident through the advanced training processes of chefs, utilization of virtual reality to simulate ergonomics and optimal layout, and the utilization of QC Circles. The visit was made even more impressive by the fantastic meal and service. Improvement is a constant effort and things are always flexible. Simple improvements using basic, inexpensive materials are the best initial way to challenge your creativity. We visited a few suppliers during the mission and were constantly reminded of the interaction and development that takes place. The Quality Circle activity throughout the week showed us the level of engagement that is possible. We appreciate you following our journey this week, and we hope to see you on the next mission the week of May 12, 2019.